Discussion in 'Carothers Performance Knives' started by Nathan the Machinist, Oct 20, 2017. I've been seeing his sheaths around the forum and something about the artwork caught my eye. And I want a sheath from Grog. One with some of that dark and twisted artwork like he does. So I'm wondering what is involved in getting a sheath from Grog when this sheath shows up from him! Thank you so much to both Grog and his evil enabler Matty. I was wanting one of these so bad and to have one turn up out of the blue like this was truly a touching gesture. The build and construction are first rate, but it is the color, design, texture and artwork that keep me fondling it. This is just SUCH A COOL SHEATH. Thank you. din, indawire, Odog27 and 37 others like this. P.S. fooque me! That's absolutely stunning and GORGEOUS!!! Brian77, MarriedTheMedic, Standard78 and 1 other person like this. ...that has got to be one of the finest pieces of leather work I have ever seen!! What an awesome combo you have there Nathan! MarriedTheMedic, Standard78 and Jo the Machinist like this. gusbuster, Brian77, Karoi and 10 others like this. and a fitting match for the beast within. MarriedTheMedic, Casinostocks and Jo the Machinist like this. MarriedTheMedic, Jo the Machinist and Casinostocks like this. You got your BC sheath the first out of everyone else, probably because you're too handsome! I'm still waiting for mine which means... Oh wait!!! MarriedTheMedic and Jo the Machinist like this. Brian77, MarriedTheMedic, trevitrace and 4 others like this. Thanks for taking the time to take those pictures, they came out great! It was fun scheming with Jo and Mat on getting this one there. 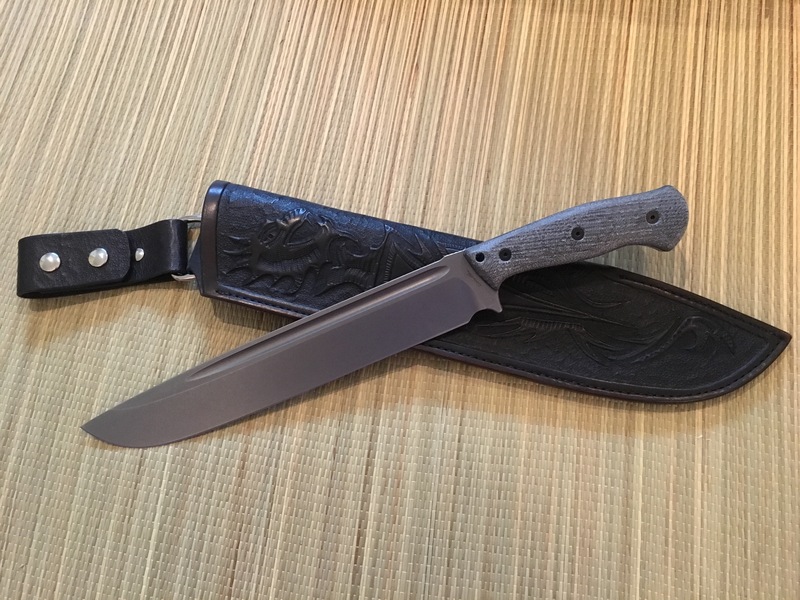 Those handle scales look fantastic with the sheath! I'm not sure which was more fun about this, hearing how stoked Nathan was about the sheath or having a chance to get my mitts on this superb Behemoth. Odog27, Brian77, MarriedTheMedic and 3 others like this. Brian77, MarriedTheMedic and Jo the Machinist like this. A Grogimus sheath is in my future. Sooner than later for sure.. some people just ooze talent..
Jo the Machinist, Casinostocks and TommyGun56 like this. I'm close as well, I should be in the next batch of his sheath projects! MarriedTheMedic, Jo the Machinist and grogimus like this. without any permission from Grog decided to expose some of his work at my own expense! Tazz-ab, MarriedTheMedic, Standard78 and 2 others like this. @grogimus your work is simply beautiful. Tazz-ab, Wood5045, MarriedTheMedic and 7 others like this. MarriedTheMedic and grogimus like this. I agree 100%. Here’s mine. Sorry for the poor pics, they don’t do it justice. I’ll have to try to take some better ones when I get a chance. Wood5045, donscpoo, MarriedTheMedic and 4 others like this. MarriedTheMedic, gusbuster and Jo the Machinist like this. MarriedTheMedic and Standard78 like this.